In an incredibly controversial finish, #20-Tony Stewart finally picked up his first Sprint Cup win of 2008 at Talladega, the track where he had finished second on six previous occasions. His car had suffered minor damage in Friday’s final practice session when he rear-ended #38-David Gilliland and slid down the banking during #88-Dale Earnhardt, Jr.’s wreck, but was fortunate not to have to use a backup car. After qualifying back in the 34th position, he took the lead for the first time on lap 80 and held it briefly in that and a few other bursts in the late stages. After narrowly avoiding involvement in the eighth caution of the race when he rear-ended #7-R. Gordon much as he had #38-Gilliland on Friday, he took the top spot for the final time with 17 laps to go when the line of cars he led caught a six-car breakaway led by #42-Juan Pablo Montoya on the outside. Stewart held the lead through two late cautions which set up a green-white-checkered finish where he would have to hold off the three Dale Earnhardt, Inc. cars of #01-Regan Smith, #15-Paul Menard, and #8-Aric Almirola. On the final lap, #01-Smith made a late move on Stewart coming into the tri-oval which Stewart blocked, forcing #01-Smith to go below the yellow line. Though #01-Smith beat Stewart to the finish line and the DEI crew celebrated, NASCAR disallowed the pass and handed Stewart the win. The race featured a NASCAR-record 28 different leaders. Led a race-high 24 laps. 2) #15-Paul Menard A big week for him began with an announcement on Tuesday that he would be taking his sponsorship to Yates Racing as the team’s third driver in 2009. It ended with his best career finish at a track where he had scored his previous-best run of the season in April. He remained with DEI teammates #1-Truex, Jr., #8-Almirola and, later, #01-Smith for much of the race and particularly benefitted from the drafting help of #8-Almirola’s machine. Somehow, #01-Smith got ahead of both he and #8-Almirola in the final 10-lap run to the checkers, and the three got ready for a showdown with the leader, #20-Stewart. 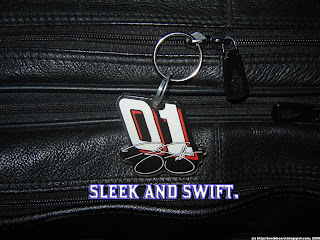 When teammate #01-Smith was controversially ruled to have made an illegal pass for the win, he was credited with his best-career finish. Led 6 laps. 3) #6-David Ragan After being forced to give up his 16th place starting spot due to an engine change on Friday, he was leading by lap 21 and, once again, established himself as a contender for his first Sprint Cup win. Despite spinning on pit road under the first caution on lap 34 to avoid the car of #70-Raines, he remained near the front of the very-crowded lead pack. His car, along with #8-Almirola and #11-Hamlin, was a particularly aggressive bump-drafter and, with his family in attendance, was putting on quite the show. He got into a little shake-up with #42-Montoya on lap 75 when, while racing for 2nd, he cut off the #42 and forced him below the yellow line. Still near the front, #88-Earnhardt, Jr. launched him to the lead once more with 30 to go, raced the #88 for the lead with 27 laps remaining, then slipped back around 6th. Around that spot, he brought out the eighth caution of the race when he bumped #29-Harvick too hard into turn three, sending the #29 into a spin which he barely avoided. With 10 to go, he restarted 4th after the big ninth caution and second red flag of the race, fell back when he moved up high, then rallied back to get a front-row seat of the controversial finish. Led 11 laps. 4) #31-Jeff Burton** “Near giddy” about having the best car he’d ever claimed to have at Talladega, he qualified 17th and proceeded to put that claim to the test. He narrowly avoided the wrecking #1-Truex, Jr. in the first big wreck on lap 68, was up to 3rd for the lap 73 restart, and led with 71 to go. With 40 laps to go, his car led a Childress trio back to the front, running 4th through 6th in the order they had finished at Bristol with #29-Harvick and #07-Bowyer behind. The trio then shuffled past #88-Earnhardt, Jr. on the inside with 32 to go. Led 8 laps. 5) #07-Clint Bowyer** Went to a backup car after suffering undisclosed damage during #88-Earnhardt, Jr.’s accident during Happy Hour. His car seemed to be at its best when it mattered most as, in following Childress teammates #31-J. Burton and #29-Harvick, he suddenly became a factor in the final 32 laps. He was up to 2nd behind #18-Ky. Busch with 35 to go when #88-Earnhardt, Jr. routed him out of the groove, his car moving low as the #88 got by. His teammates helped him get his revenge when they slid past the #88 on the inside three laps later. 6) #43-Bobby Labonte Barely avoided involvement in the fourth caution and first red flag of the race on lap 68 to pick up one of the many surprising finishes that marked the afternoon. 7) #66-Scott Riggs Having qualified 11th, he played it conservative early on and suddenly became a legitimate factor in the top 10 when he was helping the Roush-Fenway cars of #6-Ragan and #17-Kenseth at the front of the pack on lap 95. Under the sixth caution on lap 99, he even led the field off pit road and held the top spot through the restart. Much as he had avoided involvement in #88-Earnhardt, Jr.’s practice crash, he avoided the final big wreck with 15 to go and successfully defended his first top 10 finish of the year. Led 4 laps. 8) #7-Robby Gordon Picked up his fourth top-15 finish in as many restrictor plate races in 2008 to mark his 300th Sprint Cup start. It didn’t start of easy, however, as he lost the draft not long after #48-Johnson and, on lap 34, was promptly lapped by the field on the backstretch, his car pulling to the inside. As luck would have it, the first caution of the race came out at that very moment for debris. His car, surprisingly, was ahead of #48-Johnson’s in the lead pack, giving him the Lucky Dog. He made at least one extra stop, however, as he was just getting back up to speed off pit road one lap after the lap 39 restart, putting him a lap down once more. Luck shined on him again as he got the Lucky Dog a second time when #24-J. Gordon’s crash on lap 54 brought out the third caution of the race. His car was rear-ended by #20-Stewart as he checked-up for the eighth caution of the race with 24 to go, but fortunately neither car suffered serious damage. The finish, coupled with the equally-strong runs of #00-K. Wallace and #66-Riggs, did not change the top 35 in owner’s points and he still sits 35th in points, 17 behind the #84 team and 39 ahead of the #00 team. 9) #48-Jimmie Johnson** In a race which, for years, had been his Achilles’ Heel after several poor finishes, he managed to overcome much of what had before seemed insurmountable for his team. Driving the car with which he had won the pole for the Daytona 500, he was concerned during qualifying about an engine vibration which, his crew admitted, was only 80% repaired. He qualified 20th, then had to go to the back on race day when his crew checked his pistons before the race. When the green flag dropped, he intended to follow-through with his plan to lag back and avoid a huge wreck, but he laid back too far and lost the draft. By lap 7, he was already 7 full seconds behind the leader, and he dropped to 18 seconds back just 5 laps later on lap 12. He teamed up with #96-Schrader, who also lost the draft, and despite the best efforts of the #96 to push him along, they were both swallowed up by the lead pack on the backstretch on lap 25. While #96-Schrader fell back, he stayed with the leaders and was pushed by #88-Earnhardt, Jr. in front of leader #6-Ragan on lap 26. The assistance, however, ended as the #88 cut down and passed them both to take the lead for the first time. He barely lost the Lucky Dog under the first yellow on lap 34 to the just-lapped #7-R. Gordon, restarted as the only car on the inside on lap 39, then got his lap back as the Lucky Dog under the second debris caution on lap 46. More adversity came during the third caution on lap 54 when a huge piece of tire debris off #44-Reutimann hit the nose of his car, breaking a splitter bracket that required repairs. The repairs were successful and, by lap 76, he took the lead for the first time. After falling back in the competitive race, he had the rev limiter chip on his ignition box removed under the fifth caution on lap 81. The lead exchanged several more times and, frustratingly, he was again behind the lead pack in 26th with 40 laps to go. Looking to make up ground, he took on four tires under the eighth caution with 24 to go, but lost some ground on pit road when #96-Schrader forced him to back up in his stall. His crew helped him out, however, by getting him off pit road first under the ninth caution of the race with 15 to go. Somehow, someway, he managed to fight his way back into the top 10 yet again by the time the checkered flag fell. Now leads the Sprint Cup standings by 72 over #99-Edwards, who finished 29th. Led 3 laps. 10) #19-Elliott Sadler Had a very solid run in a race which, from 2003 through 2005, he had suffered much misfortune. He led off pit road under the second caution of the race on lap 46 and made his move in the late stages, narrowly avoiding involvement in the ninth caution and second red flag of the race when he missed the wrecking #28-Kvapil. He restarted 3rd when the race was restarted with 10 laps to go, passed #78-Nemechek for 2nd, and proceeded to move #20-Stewart to an even bigger lead. Though the three DEI cars got by him soon after, he marched his way back to 4th during the green-white-checkered finish only to fall back once again when he tried to get by on the outside and was hung out by the field. Led 4 laps. 11) #78-Joe Nemechek Qualified 7th, ran in the top 5 during the early close racing, then survived the big ninth caution and second red flag with 15 laps to go to find himself running second to #20-Stewart. Though he lost 2nd to #19-E. Sadler on the restart with 10 to go and slipped back, he still picked up his best-ever finish with Furniture Row Racing. Led 1 lap. 12) #00-Kenny Wallace Qualified for his first race since the Daytona 500, but was held a lap under the first caution of the race on lap 34 when he sped down pit road at over 100 mph. He then received the Lucky Dog under the big fourth caution and first red flag of the race on lap 68. Under that red flag, he had a large chunk of another car’s splitter wedged under the front of his car, but a track official was kind enough to remove it. Led 3 laps. 13) #8-Aric Almirola Amidst persistent rumors of his U.S. Army sponsorship moving to #12- Newman’s 2009 ride at Stewart-HAAS Racing, he turned in perhaps his best performance of the season. He led the DEI charge during qualifying on Saturday by backing-up his season-best 3rd starting spot from Martinsville and, on Sunday, was instrumental in keeping his teammates in contention for the win. Teammate #15-Menard shoved him past #83-Vickers on lap 14 and, when he wasn’t out front, he was frequently pushing cars to the top spot, particularly #15-Menard. His greatest push came on lap 92 when he followed #88-Earnhardt, Jr. along the extreme-high lane off turn three and launched the #88 to the top spot. Often, his car also flirted with the yellow line on the bottom of the track, peeking out of line to make his next move. He restarted 4th behind teammates #01-Smith and #15-Menard for the green-white-checkered finish, but lagged back too far on the restart and lost some spots, narrowly getting back into line and leaving it to his two teammates to go for the win. Led 3 laps. 14) #5-Casey Mears Was one of the many surprises in qualifying when he started on the outside-pole for his own best start of the season. Knowing his wife was about to give birth to their first child, he was also certainly racing with a lot on his mind. He restarted 5th on the restart with 10 laps to go, but must have been tight on fuel as he pitted when the tenth and final caution fell six laps later. Led 2 laps. 15) #18-Kyle Busch** The April winner took the lead for the first time with a huge push from #11-Hamlin on lap 51 that got him to a 0.5 second lead on the field before #2-Ku. Busch, and #83-Vickers led a drafting line that passed them back up once more. He led the field off pit road under the fifth caution on lap 81 and again under the seventh caution with 50 to go, at which point #88-Earnhardt, Jr. made a spirited charge to try and take the lead from him with 35 laps to go. He sustained minor damage to the right side of his car during the ninth caution and second red flag of the race, but still picked up what was easily his best finish so far in the Chase. Led 20 laps. 16) #96-Ken Schrader Was placed back in the car when Hall of Fame Racing and Joe Gibbs decided to leave 2009 rookie Joey Logano out of the #96 for the rest of the year. He lost the draft soon after #48-Johnson in the early stages and, by lap 23, his crew chief was getting cues from #48 crew chief Chad Knaus to have him drag the brake and draft #48-Johnson. The effort was futile, however, as both he and #48-Johnson were promptly swallowed up by the lead pack on the backstretch on lap 25. He then fell back in the pack and lost at least two laps. He got them both back as the Lucky Dog, the first when #33-M. Wallace brought out the fifth caution on lap 81 and the second when #11-Hamlin brought out the sixth caution on lap 99. He was one of many cars that scored an excellent finish by surviving, though his car was stopped a little too early in his stall under the eighth caution with 24 to go, forcing #48-Johnson behind him to back up. 17) #45-Terry Labonte Suffered some damage in the big fourth caution and first red flag of the race when he clipped the rear of the wrecking #83-Vickers, then was spun further down the track when the wrecking #9-Kahne squeezed him against the wall near the start/finish line. Fortunately, he avoided further contact and returned to competition. He did, however, lose three laps as a result, but got all of them back as the Lucky Dog when #24-J. Gordon’s engine failure brought out the seventh caution with 50 to go, when #29-Harvick’s spin brought out the eighth with 24 to go, and when the second huge wreck brought out the ninth with 15 to go. 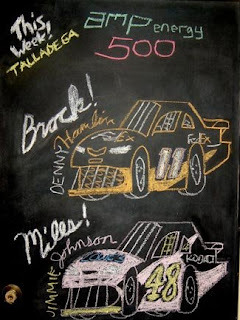 18) #01-Regan Smith (R) Oh, what should have been—! In a race marked by chaos and unpredictability, he slipped into contention in the final stages as the ultimate underdog. While he had not been as visible through the race as his other three DEI teammates, he found himself leading the charge with 7 to go when #15-Menard and #8-Almirola pushed him up to 2nd after #19-E. Sadler had pushed leader #20-Stewart to a big lead. The DEI trio hugged the bumper of the #20, waiting for an opportunity, when #26-McMurray brought out the tenth and final caution with 4 to go to force a green-white-checkered finish. After #8-Almirola got a slow start, he, #15-Menard, #6-Ragan, and the rest of the pack bided their time all the way until they entered the tri-oval for the final time. There, he tried to move high past #20-Stewart, but when the #20 blocked him, he cut low and was blocked once more by the #20 to the point that he was forced below the yellow line. The checkered flag in sight with teammate #15-Menard behind him, he kept his foot in it and edged #20-Stewart by a half-carlength to win his first career Sprint Cup race. As he and #15-Menard celebrated on the backstretch while his crew celebrated on pit road, however, NASCAR reviewed the play and decided #20-Stewart had, in fact, won the race as the #01 had made the winning pass below the yellow line and didn’t throttle back on the home stretch (yeah, that makes sense). Asa a result, NASCAR penalized to the last car on the lead lap, but still became the top-finishing rookie for the series-leading ninth time in 2008, breaking his tie with fellow leader #77-Hornish, Jr. (who DNQ’d for the first time in 2008) with eight followed by #10-Carpentier with seven and #00-McDowell with six. 19) #55-Michael Waltrip Announced on Wednesday that #66-Riggs’ crew chief “Bootie” Barker would be his new crew chief in 2009. He survived the first wreck on lap 68 only to get a commitment cone penalty under the yellow. Fighting to make up ground, his car was severely damaged during the fifth caution of the race on lap 81 when the strip of rubber from #33-M. Wallace’s blown tire hit the hood and roof of his car. The incident put two sizeable dents in those spots, forcing his crew to screw on several metal plates and apply tape. Even in this damaged state, he managed to fight his way to the front in the final stages and, with 25 to go, was even shoved into the lead twice by #42-Montoya. He received a more unwelcome shove in the closing stages of the wreck that was the ninth caution and second red flag of the race when the damaged #29-Harvick slid down the track into him, tearing up the right side of his car, requiring yet more repairs. Led 1 lap. 20) #29-Kevin Harvick** Took the lead during the first long green-flag run with 63 to go as he led a 7-car breakaway that had managed to distance itself from the rest of the field. When #88-Earnhardt, Jr., #42-Montoya, and #6-Ragan began to mix up the leaders once more as #18-Ky. Busch tried to hold the top spot, he was then racing #6-Ragan into turn three with 24 to go. It was then that he was involved in the eighth caution of the race when #6-Ragan bumped him too hard going into turn three, causing his car to drift sideways and slide into the grass. Fortunately, he avoided any more damage than a broken splitter bracket as everyone, particularly #6-Ragan, managed to miss him. He was making up for lost ground with 15 to go when his luck ran out in the form of the ninth caution and second red flag of the race. He avoided the initial wreck and moved to the high lane coming off turn four when #99-Edwards’ sliding car collided with his, pinching him into the outside wall. His car then slid down the track and collided with the passing #55-Waltrip, tearing the right-side sheetmetal on the #55. The wreck effectively ended his nine race top-10 streak since his wreck at Indianapolis in July. Led 22 laps. 21) #2-Kurt Busch Took the lead for the first time on lap 51 when he and #83-Vickers reeled in #18-Ky. Busch and #11-Hamlin, who had jumped out to a 0.5 second lead. However, just barely after teammate #12-Newman went behind the wall, his own hood was up under the third caution on lap 54 as his engine was starting to misfire. He lost several laps for repairs, managed to get back on the track by lap 73, but was extremely slow around the bottom of the track for the rest of the race. Led 2 laps. 22) #22-Dave Blaney Struggled with some bad luck early in the race when, on lap 49, it was reported he had an electrical problem. Fortunately, his crew seemed to fix the problem as he was back up to the 8th spot with 15 laps to go. On that lap, he narrowly averted disaster when he crossed the nose of #42-Montoya going into turn three, wobbling beneath the yellow line before returning to the track further back in the field. He was then immediately in the middle of the ninth caution and second red flag of the race one corner later when, after narrowly missing the sliding #99-Edwards, he was hit in the right-front tire by the damaged #41-Sorenson and couldn’t stop turning to the right, steering both cars into #42-Montoya as the three all hit the outside wall together. 23) #41-Reed Sorenson After leading briefly in the earlier stages of the race, he was taken out towards the end of the ninth caution and second red flag of the race. After avoiding the initial three-car Roush-Fenway tangle, he could not avoid the wrecking #28-Kvapil and hit the rear of the #28, knocking his car into the right-front of the passing #22-Blaney, who then turned hard-right from the damage, steering both cars into #42-Montoya, who was trying to get by up high. The three bounced off the outside wall before they, too, slid down the banking. Led 2 laps. 24) #16-Greg Biffle** Lagged back at the back of the pack all day, but unlike #48-Johnson, did not lose the draft. The strategy seemed to be paying off as he was not near the big wreck on lap 68, though he had collected a complete windshield tear-off from another car on the front of his Ford. He finally made a move toward the front in the final 20 laps and, with 15 to go, was going for the lead past teammate #17-Kenseth in turns three and four when a bump from #99-Edwards turned him hard left into the #17. In that ninth caution and second red flag of the race, the two then spun up the track and collided with #99-Edwards, trapping #88-Earnhardt, Jr. in the process. His car continued around the track, shooting sparks as the trunk cover dragged behind. Led 2 laps. 25) #42-Juan Pablo Montoya Determined to prove his runner-up finish in the spring event was no fluke, he became a significant factor in the race after the first big wreck on lap 68 when, on lap 74, the fleet Toyota of #11-Hamlin first shoved him into the lead. He was angry the following lap, however, when #6-Ragan cut him off on the backstretch, forcing him to get loose below the yellow line before saving it and returning to the track. Though he feared he sustained some right-front damage in the incident, none was clearly seen, and he was again pushed to the lead by #88-Earnhardt, Jr. on lap 107. With 73 to go, his car had picked up a windshield tear-off that had been balled-up and stuck to the left-front of his splitter, but he still remained with the leaders, moving up to 3rd with 30 to go, pushing #55-Waltrip to the lead with 25 to go, and leading on the restart with 19 laps remaining. He and five other cars built up a sizeable lead on the restart, but #20-Stewart and the rest of the field lined up and passed them all on the outside with 17 to go, setting up the final scramble to the finish. He nearly escaped the big ninth caution and second red flag of the race unscathed with a run to the outside, but the chain-reaction “follow-up wreck” between #28-Kvapil, #41-Sorenson, and #22-Blaney led to his car being pinned into the outside wall off turn four by #22 and #41, ending his sterling run. Led 9 laps. 26) #17-Matt Kenseth** Took the lead for the first time on lap 41, but was struggling with an overheating problem under the fifth caution on lap 81 that had brought his water temperature up to 290 degrees. The problem must have been fixed under the yellow, for he was back to racing #11-Hamlin and #88-Earnhardt, Jr. for the lead by lap 95. Learning that #99-Edwards was still struggling at the back of the pack, he fell back to around 15th with 42 laps to go. He was leading with 15 to go when he teammate #16-Biffle was turned down into him by #99-Edwards, setting off the ninth caution and second red flag of the race. The contact turned him up the track right behind #16-Biffle, trapping #88-Earnhardt, Jr., who had nowhere to go and ran into his passenger door. The two cars remained welded together in this position as they slid down the track before finally separating when they hit the grass. Led 5 laps. 27) #28-Travis Kvapil His 100th Sprint Cup start began on a thrilling note when he took his first career pole position on Saturday morning. The moment was an emotional one for him as he reflected on the significance of bringing Yates Racing a pole position in Davey Allison’s #28 at a track both team and driver had made famous. His Ford held the lead for the first 7 laps before #83-Vickers made a move to the top spot. Despite some struggles with his pit crew including a slow stop under the first caution on lap 34 when his crew struggled with the left-rear tire and a penalty for a loose tire under the fourth caution on lap 68, he hovered in the lead pack around 15th for much of the race. He was back up to 6th with 57 laps to go and was minding his own business in the top 10 when he was taken out in the ninth caution and second red flag of the race. There, the damaged #99-Edwards slid directly into the side of his car, sending his car spinning up the track and hard into the outside wall, whereupon it was hit by the passing #41-Sorenson. Once his car stopped on the apron, he climbed out, visibly upset. Led 10 laps. 28) #88-Dale Earnhardt, Jr.** One of the roughest weekends in recent memory for him began on Friday when he blew an engine early in the first practice session, then was forced to a backup car in a freak accident early in Happy Hour. There, leading #38-Gilliland, #20-Stewart, and others through turn three, he punctured his right-rear tire. The tire exploded violently, ripping off much of the sheetmetal from the rear of his car, trapping #38-Gilliland against the outside wall as he spun. The car was further damaged when #9-Kahne collided with the rear of his tattered machine. Though the accident itself, being before qualifying, would not have forced him to start at the back of the pack, the engine failure did, dropping him to the back after qualifying 15th. His backup car, still bearing, as the primary had, the names of several thousand fans who entered an online contest, was still a proven machine as he had raced it in the Daytona 500 in February. After starting at the tail end of the pack, he was up to 29th on lap 3 and the lead on lap 26 when he used the lapped car of teammate #48-Johnson to get around #6-Ragan. As the leader when the first big wreck occurred on lap 68 to bring out the fourth caution and first red flag, he kept the lead at that point and held it through pit stops. Several times after, he marched back to the front, receiving perhaps his greatest push to the lead from #8-Almirola who helped him draft into the top spot in the extreme-high lane. In the final 40 laps, he turned up the wick and fought even harder for the lead. With 35 to go, he knocked #07-Bowyer loose in turn two to get up to 2nd and nearly got by leader #18-Ky. Busch, who was blocking #07-Bowyer down low. He then started fighting three Childress cars with 32 to go, a stubborn #6-Ragan with 30 to go, and a resurgent #42-Montoya with 26 to go. Unfortunately, bad luck struck again when he was taken out in the ninth caution and second red flag of the race. There, he had nowhere to go when the Roush trio of #16-Biffle, #17-Kenseth, and #99-Edward wrecked in front of him in the outside lane, forcing him to broadside #17-Kenseth before the two slid down the track. His car then separated from the #17 and came to rest against the inside wall. Led 19 laps. 29) #99-Carl Edwards** Led briefly in the first 10 laps while battling with #83-Vickers, but soon turned his attention toward pit strategy. Fearing a repeat of his pit road woes the previous week at Kansas, he vowed to pit a lap later than the rest of the field to avoid such contact. Contact must have occurred on the race track, however, as his crew, during the third caution on lap 54, was concerned about damage to the nose of his car, but didn’t find any. He did, however, have to go to the tail end of the longest line for a pit infraction. He was still struggling toward the back of the lead pack inside the final 50 laps and #17-Kenseth fell back to help him get back up with the leaders. Aided by the eighth caution with 24 to go, he then started to move back up through the pack, following #16-Biffle who had been lagging back with him for much of the race. Unfortunately, while pushing the #16 through turns three and four, he slid up during one push and turned #16-Biffle sideways, setting off the ninth caution and second red flag of the race. The contact sent #16-Biffle into #17-Kenseth in the lower lane, causing both cars to slide back up into him, trapping #88-Earnhardt, Jr. in the high line in the resulting wreckage. His car then ground against the outside wall before it slid down the banking directly into the passing #28-Kvapil, turning the #28 into the outside wall with his car following after, nearly hitting #22-Blaney and #42-Montoya before stuffing #29-Harvick into the outside wall. His car finally came to rest on the apron without hitting any other cars. Led 2 laps. 30) #33-Mike Wallace Qualified an impressive 5th spot in a Richard Childress R&D car for his first Sprint Cup start of the season. His was the first car to challenge polesitter #28-Kvapil for the lead on lap 4 and he seemed sure to lock up a top 10 as he hovered near the top 5 for much of the early stages. He was leading when the first caution fell on lap 34, lost some spots on pit road when his car stalled, avoided the first big wreck on lap 68, and was back up to 2nd on lap 81. It was on that lap, however, that his good day turned bad as he brought out the fifth caution of the race. His right-rear tire exploded in much the same way as #44-Reutimann’s earlier in the event, tearing up his rear quarter-panel, but he fortunately held onto his car and pulled safely to the bottom of the track. Unfortunately, his car was not a factor after the incident and, like in the #44's wreck, the tire debris damaged another car, this time #55-Waltrip. 31) #84-Mike Skinner On the Tuesday before the race, he was announced as the interim driver for the #84 after A.J. Allmendinger was released, taking over the ride for two races until Formula 1 and ARCA star Scott Speed would take over the car at Martinsville. His restrictor plate prowess not only got him into the field, but into the lead for a moment on lap 59 after the third caution of the race. Nine laps later, he was involved in lap 68's big fourth caution and first red flag of the race when, while riding behind #38-Gilliland and #70-Raines on the low part of the tri-oval, he suffered some damage trying to get beneath the two at the moment the #70 hit the spinning #1-Truex, Jr. His car continued straight down the apron in a similar manner to #38-Gilliland where the spiraling #9-Kahne crossed his path, further damaging the front of his car as he couldn’t slow down in time. He returned to the track several laps down with 69 laps to go. 32) #26-Jamie McMurray Ran near the front very early on, but was severely damaged on lap 68 in the early stages of the fourth caution and first red flag of the race. After spinning #1-Truex, Jr., the wounded #83-Vickers crossed his hood and put him into the outside wall, grinding his car along the fence as the wreck unfolded in front of them. He finally broke free from the #83 after a few seconds, but the right side of his car was severely scraped-up. He also brought out the tenth and final caution of the race with 4 to go when he blew a right-rear tire in turn two and spun, forcing a green-white-checkered finish. Led 3 laps. 33) #21-Jon Wood (R) After not only qualifying a respectable 27th but, unlike his previous two starts of 2008, not having to go behind the wall after three laps to adjust his car’s qualifying setup for race conditions, he became the innocent victim of the race’s third caution on lap 54. There, while running the outside groove on the backstretch, #24-J. Gordon suddenly turned right to avoid #44-Reutimann and, in doing so, crossed his hood, grinding his car against the outside wall and damaging his car’s nose. He returned to the race much later in the event with a new nose on the car. 34) #70-Tony Raines Qualified an outstanding 8th for his third straight top-25 start, but made an unscheduled stop during the first caution of the race on lap 34, perhaps from dropping the debris that brought out the caution. There, he was penalized for coming down pit road before it was open. He was forced to make an extra stop under the yellow and forced #6-Ragan to spin himself out in the process. On lap 68, he then suffered damage in the big fourth caution and first red flag of the race. He was running near the bottom of the tri-oval and closing in on the sideways #1-Truex, Jr. when #38-Gilliland slid up into him, knocking his car into #9-Kahne, who collided with the #1. As #1-Truex, Jr. was turned back up the track, his car hit the #1 in the rear, damaging the right side sheetmetal of his car. 35) #83-Brian Vickers Was fastest in the abbreviated final practice session on Friday and looked to repeat in the race where he picked up his first Sprint Cup win two years prior. He was the first driver to wrestle the lead from polesitter #28-Kvapil around lap 8 and kept on the pressure near the front of the pack. Entering the tri-oval on lap 68, he was still in the thick of the battle, running in the middle of a tight-three wide pack for the lead, when disaster struck in the form of the fourth caution and first red flag of the race. His right-front tire exploded, tearing open part of his car’s hood and turning him hard right into the left-rear of #1-Truex, Jr. As the #1 slid down the track, his car crossed the nose of #26-McMurray, who was thus flattened against the outside wall. #45-T. Labonte came by at that time and clipped the right-rear of his car. Miraculously, as his car then slid down to the inside, his car avoided any other hits as the chaos of the first huge wreck of the day took place down the track. Led 10 laps. 36) #9-Kasey Kahne Like #88-Earnhardt, Jr. and #38-Gilliland, he was unfortunate enough to lose one car in the #88's Happy Hour accident and another on race day. He was in the wrong place at the wrong time on Friday when he clipped the wrecked #88 with his right-front fender, shearing off the fender and forcing him to a backup car which qualified 38th. On lap 68, he was in the lower groove just in front of #38-Gilliland and #70-Raines when the #38 knocked the #70 into the rear of his car, turning his machine hard left into the sideways #1-Truex, Jr. His right-front fender torn up once more, he spun diagonally across the track and pinched the wounded #45-T. Labonte against the wall, sending the #45 spinning down the track. The contact turned his car left, directly in the path of the damaged #84-Skinner on the apron, and after he was knocked into another spin, his car was finally stopped against the inside wall by a low-speed collision with #38-Gilliland’s damaged car. Led 1 lap. 37) #44-David Reutimann In Happy Hour on Friday, he barely avoided involvement in #88-Earnhardt, Jr.’s accident by spinning, but like #07-Bowyer, was forced to a backup car despite comparatively minor damage. Sunday, unfortunately, didn’t go much better. He brought out the third caution of the race on lap 54 when he blew a right-rear tire on the backstretch, the ripped tire damaging the front of #48-Johnson. His car wobbled in the path of #24-J. Gordon, who swerved to the right to avoid him and ended up tangling with #21-Wood. His car spun to the inside of the track with noticeable damage to his right-rear quarter-panel. Amazingly, his crew made successful repairs to his car and, for a while, he remained in the thick of the battle in the lead pack. However, the Cinderella run ended on lap 112 when he limped onto pit road, his car not under power. 38) #24-Jeff Gordon** After unveiling a new black version of his paint scheme for 2009, he entered the race as its defending champion, determined to end his winless skid before it reached the one-year mark at Lowe’s the following week. After qualifying 26th, he raced his way up to 15th after 3 laps, fell back around the time he learned teammate #48-Johnson had lost the draft, then was back battling #28-Kvapil for the lead on lap 32. He led off pit road under the first caution on lap 34, but faced disaster just 20 laps later in the third caution of the race on lap 54. There, he had nowhere to go when #44-Reutimann, who had lost a right-rear tire, wobbled in front of him, and he lost control trying to avoid the #44. His car turned hard to the right and crossed the nose of #21-Wood, shoving his car into the outside wall. He returned to the track 33 laps down on lap 87 with a new front end on his car, but was finally taken out when his engine blew with 50 to go, bringing out the seventh caution of the race. Led 3 laps. 39) #11-Denny Hamlin** Suffered some minor damage during #88-Earnhardt, Jr.’s Happy Hour wreck, but was not forced to a backup car. This was a good thing as his car was one of the fastest in the first half of the race, replaying his daring two-car drafts to the front that he had perfected in the April race. He used the first of these to shove teammate #18-Ky. Busch to the lead on lap 51 and another to shove #42-Montoya out front on lap 74 before taking the lead himself. Despite his car’s power and the fact he was again leading on lap 92, his car battery wasn’t producing enough voltage. Though his crew had a plan for dealing with this problem, they never got the chance to put it into practice. On lap 99, while running the low line as the leader between turns one and two, his right-front tire suddenly exploded, sending his car hard into the outside wall, where it stayed for several yards. The hit was extremely hard, so much so that he took his time getting out of the car, was put on a gurney, and was sent to a local hospital for further evaluation. Fortunately, he escaped serious injury. Led 9 laps. 40) #38-David Gilliland Suffered a setback during Happy Hour on Friday when #88-Earnhardt, Jr.’s freak tire failure wound up with his car totaled as well, pinched against the outside wall by the #88. His backup could was only fast enough on Saturday to qualify 41st. He had hoped to keep his nose clean, but the fourth caution and first red flag of the race on lap 68 made short work of him. He was running the low line through the tri-oval when the wreck started and, upon seeing #1-Truex, Jr. slide down the track, tried to turn right, but wound up sideswiping #70-Raines, damaging his fender and forcing #70-Raines to swerve into #9-Kahne. He kept going straight across the apron past the start/finish line with a torn right-front before the severely-damaged #9-Kahne crossed his path near the inside wall, forcing the two into a low-speed collision after which the two cars finally stopped. 41) #1-Martin Truex, Jr. For the second week in a row, he was having an outstanding race only to have bad luck take him out of contention. He was very much a part of the DEI assault, running with his teammates, and appeared to be the best of the team’s four cars when the green flag fell. He was running around 5th spot on the outside line on lap 68 when he was taken out in the fourth caution and first red flag of the race. When #83-Vickers on his inside blew a right-front tire, the #83 clipped his left-rear, turning his car hard left toward the inside of the track right in front of the entire field. His car narrowly missed hitting both #31-J. Burton and #41-Sorenson in the middle lane before a chain-reaction in the lower lane led to #70-Raines knocking #9-Kahne into his path. The #9 crunched the front of his car and turned him back up the track, the skidding #70-Raines hitting the rear of his car as he re-entered traffic, barely missing #18-Ky. Busch and #43-B. Labonte. He then hit the outside wall, skidded across the track once more, and hit the staggered inside wall twice before coming to a stop. The entire front clip of his car came off in one piece after the final hit. He climbed out of the car justifiably furious, but okay. Led 1 lap. 42) #09-Sterling Marlin After qualifying 18th, he apparently fell out with an engine failure around the time of the fourth caution and first red flag of the race on lap 68. 43) #12-Ryan Newman A week in which he suffered a minor head injury from working on a lawnmower, resulting in four stitches on his forehead, did not improve on race day. On lap 49, he was felled by a dropped cylinder which put him behind the wall.